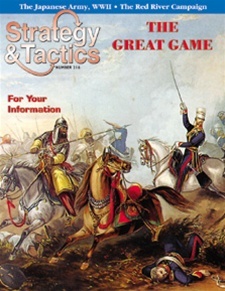 Asia Crossroads is a wargame simulating the "Great Game," the conflict between the British and Russian Empires in the 19th century for control of Central Asia. Central Asia was the frontier between the expanding Russian Empire in Asia and the British Empire in India. Central Asia also controlled vital trade routes. At stake was the fate of all of Asia. Asia Crossroads is a two player game. The British player controls the forces of the British Empire and its client states. The Russian player controls the forces of the Russian Empire. Players must use a combination of military strength, economic expansion and cunning strategy to gain control of Central Asia. Also in the game are various "native" forces. They represent the neutral or client states (and tribes) of the region. Asia Crossroads has several scenarios. Players choose which one they want to play, set it up according to its instructions, and begin play according to the sequence of pay.